In my early days, football was already taking an important place in my heart. Fascinated by the beauty of that game, I played as a goalkeeper until the age of 17 in the Parisian region – where I come from, before moving to Geneva in Switzerland in 2009. Although my passion remained unchanged at that time, I finally took the decision to focus on my studies and leave football aside. After having obtained the French Baccalaureat in 2012, I studied English for one year in Canterbury (Kent, England), which allowed me to improve my linguistic skills before joining the Glion Institute of Higher Education in Switzerland to prepare a Bachelor program in events organization. I had the opportunity to work for 5 months in a 4-star hotel in Switzerland in 2014, as well as at a fitness company in Malta one year later. After my graduation in December 2016, I worked for a couple of months at my parents’ hotel until July 2017, right after my father passed away a month earlier. Following this “unpleasant” event and thanks to my background in events organization, I worked for four months at Palexpo S.A. in Geneva, before deciding to finally end my “study-chapter” by doing a Master program, which I found at The Football Business Academy. Studying at The FBA represents for me a wonderful chance to get to know different people from all over the world, which fits to what I have been used to in my previous studying experiences. The FBA gives us a unique opportunity to be directly involved in the world of football through the network we create with some major figures of the industry, as our unforgettable experience at the Soccerex Conference in China could show. On another hand, studying at The FBA also requires me to think about several existing issues within the industry, and my future role in it. Having the strong desire to implement brightness in people’s lives, I have therefore naturally joined the EFDN to do my internship in the Netherlands. The European Football for Development Network provides me with a great overview on the different initiatives taken by European clubs towards their communities of fans, and how dedicated they can be. As “Changing Lives through Football” is EFDN’s slogan, I am constantly amazed by the multiple educational / well-being / health-oriented programs adopted by the member-clubs partnering with the organization in favor of their respective communities of fans; but also aware of the tremendous amount of work that still needs to be done in that matter. Being mainly in charge of the communication area, I am also providing my knowledge and skills based on my past working experiences in the events industry on the organization of the 11th EFDN Conference happening this November in Belgium. Although EFDN is still a quite recently born company, it is however constantly growing and expanding, as the number of members has now increased up to 64; while the organization keeps expanding its visibility through its multiple successful events throughout the year. Having started this internship only three weeks ago, I can however already tell that this experience will definitely be a valuable asset in my future career. 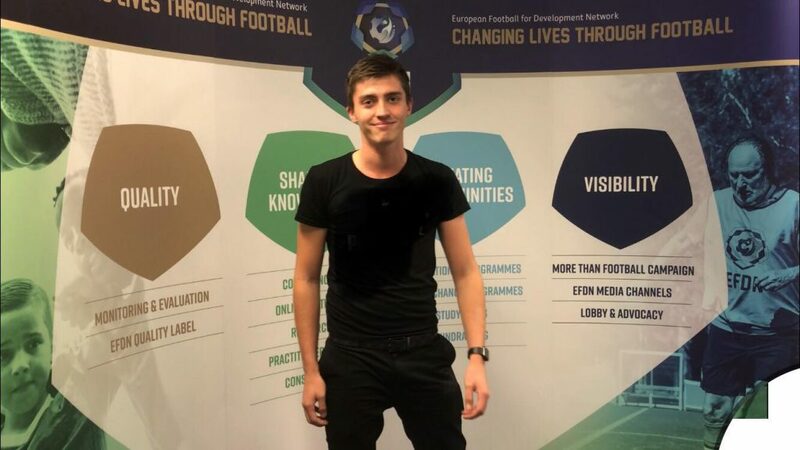 Constantly aiming to learn more, I consider this internship journey as a great way to increase my knowledge in several areas surrounding the world of football, which is extremely important to me as football has the power to gather people altogether; regardless of their origins, gender, skin colors or beliefs. Furthermore, I believe that football should be used as a smooth way to bring happiness and joy in people’s lives, while fighting against any sort of discrimination or inequality. To conclude, I would like to thank The FBA for the unique opportunity they provide their Candidates through their program; as well as EFDN, which stands for values in which I can fully identify myself; and on which I will definitely rely to make the world brighter through football. Kevin Garcia is a Candidate of The FBA’s Professional Master in Football Business 2nd Edition, expected to graduate in March 2019. He can be contacted via LinkedIn.